Most of the times, we have relationships between the objects(master-detail OR lookup) and often we need to fetch the list of all child records related to parent record in SOQL. This can be achieved using relationship query in Salesforce. We can also say it as a Inner Query (query inside query). For using relationship query, most important is, to know the Name of relationship between the two objects. 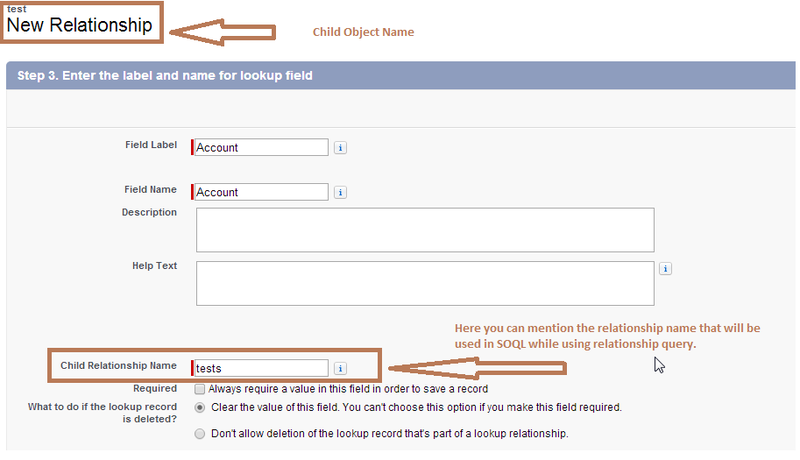 You can get this relationship name by going to the Look-up OR Master-detail field on child object. Here is the screen that you will see after clicking on the look-up/Master-detail field name that is present on child object. 1.First one is for Account(Parent) – Contact (Child) relationship. Below screen, we have opened the Lookup field present on contact(child object). 2. The second one is for some custom object. When we create a custom relationship field on any object, we get an option to choose the name of relationship, while creating the look-up or Master-Detail relationship field. Below you can see the same, and then the same name is used in relationship queries. So, in case of relationship between standard objects, relationship name is fixed already, and you can not change, but in case you are creating the relationship on your own, then you get the option of choosing the relationship name. Now you have got the relationship name. We’ll see, how to construct the query required for our problem i.e. to get all the child records related to one parent record in a single query. Here is a significant difference while making relationship queries for standard relationships(already defined by salesforce) and custom relationships(defined by user – b/w two custom objects OR b/w custom & standard object). //Perform the query on Account. //Iterate over the account with. //For each account object, get the child records using tests__r and iterate over each child records. In each specified relationship, only one level of parent-to-child relationship can be specified in a query. For example, if the FROM clause specified Account, the SELECT clause could only specify the Contact or other objects at that level. It could not specify a child object of Contact. No more than 20 relationships can be specified in a single query. In each specified relationship, no more than five levels can be specified in a child-to-parent relationship. For example, Contact.Account.Owner.FirstName (three levels).